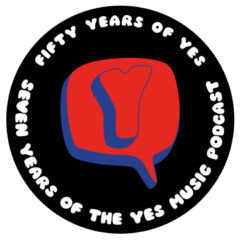 The sixty-fourth episode of the Yes Music Podcast featuring some more Quite Interesting things from Tim Morse’s book, ‘Yesstories – Yes in their own words’. Listen and see if all you agree with me that this second set are also Quite Interesting facts, then let me know by contacting me via any of the different routes on the right hand side or by leaving a comment below! What can we learn about the band from what members actually said? How does the time when the quotations were made affect the opinions given? What insights can we gain about what life in Yes was like at the time? Check out Len Rice’s photo of Rick Wakeman in action and see if you can tell when it was taken..
Just wanted to wish you and your family a very merry Christmas and I pray that God will shine bright on you and yours! Hey Kevin, I finally had the chance to listen to some of your podcasts and was pleasantly surprised to hear a shout out for Lobate! Thanks so much! I’m looking forward to being a guest on YMP. Happy New Year! Hi Adam – thanks for listening! I’m also looking forward to speaking to you! Previous Previous post: Tom Brislin interview for Yes Music Podcast in 2013!